This middle school summary is based on the article "Iron: A Necessary Nutrient." All human beings need the mineral iron in their diets, but teenagers need even more iron than adults. Iron is one of the ingredients the body uses to make red blood cells. Teenagers need additional iron because as they grow their bodies need to produce more blood, and that means more red blood cells, along with the other elements that comprise blood. When a person doesn’t get sufficient iron in his or her diet, a condition called iron-deficiency anemia results. Anemia is a medical term that means “not enough red blood cells.” Anemia also can be caused by a shortage of vitamin B12, because it, too, is needed to make red blood cells. But iron-deficiency anemia is much more common than the anemia caused by B12 deficiency, which is called pernicious anemia. The two kinds of anemia have the same symptoms: feeling fatigued much of the time; getting “out of breath” easily; a pale appearance; a fast, irregular heartbeat; and a lack of appetite. These symptoms may show up very soon when a person stops getting enough iron, because the body makes red blood cells every day. Among the foods that deliver a healthy dose of iron are kidney beans and lima beans, beef, ham, turkey (dark meat), oysters and clams, sunflower seeds, and almonds. Iron is really good for you. Everybody needs to get enough iron, especially teenagers because they need it the most. Sometimes, if people don’t get enough, they can get really sick. They can get iron-deficiency anemia. This is bad because when you get it, you don’t have enough red blood cells. There’s another thing you can get called pernicious anemia. It happens when you don’t get enough B 12. If you get either of these, you’ll feel really sick like you’ll get fatigued and out of breath and look really pale. This can happen fast if you don’t get enough iron. If you don’t want to get sick, eat food that has lots of iron in it like kidney beans, lima beans, beef, ham, turkey, oysters, clams, sunflower seeds, and also almonds and sunflower seeds. 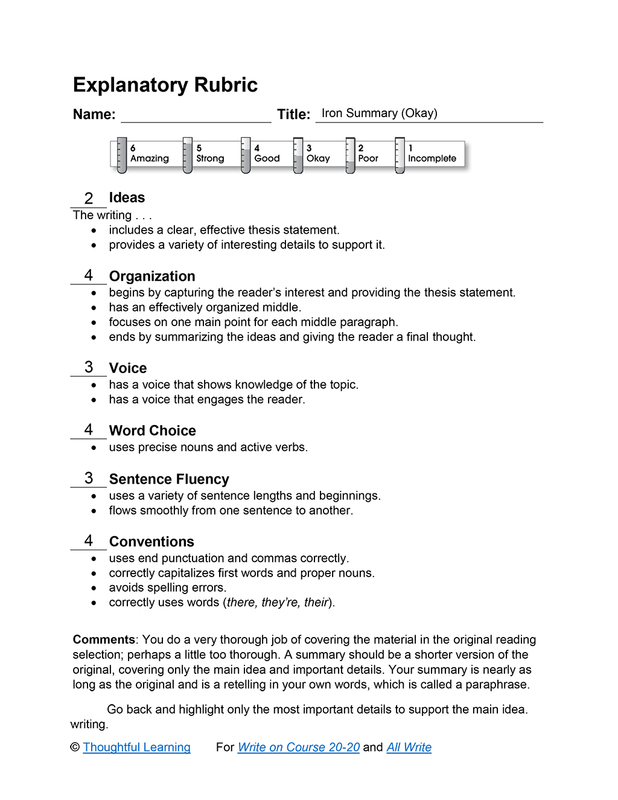 Iron Summary (Okay) by Thoughtful Learning is licensed under a Creative Commons Attribution-NonCommercial-ShareAlike 4.0 International License. Based on a work at k12.thoughtfullearning.com/assessmentmodels/iron-summary-okay.